Recently I posted that I had my first book signing a few months ago and as a result I was invited to Barnes and Noble as a local author and have a book signing there! 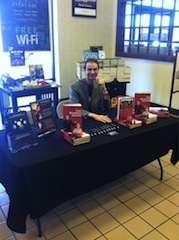 Having a book signing for The Banner Brand at Barnes and Noble was a great opportunity to reach a larger audience that I wouldn't necesarily see at a networking event or speaking engagement but can still generate leads and get more exposure for BannerView.com. Again, it was a book signing that didn't result in many books sold, but I did get to shake hands with some great people and generate a few leads for my business. Having this secondbook signing was a way to further develop both my personal brand and my business brand. The wonderful staff has invited me back, so look for more details on my next book signing. Also, there are signed copies of my book in store for purchase now. You can find the books in the local author section at the Barnes and Noble Rainbow Promenade location: 2191 N Rainbow Blvd. Las Vegas, NV 89108.